Around 50 dancers from four different groups of the tri-state area, wearing more than 100 colorful costumes (44 of them donated by the Mexican government) present 12 traditional dances, including the favorites such as the Danza de la pluma (Feather Dance) or Flor de piña (Pineapple Flower), on a stage in front of the Hudson River, organized in a span of 5 hours so that over 1500 audience members can enjoy them. This is the fifth annual Poughkeepsie Guelaguetza, promising tradition, culture and flavor so we can all be Oaxacans for a day. To find out who is behind this festival and why it´s happening, read ahead. They say it all started in 2003, when a group of women from Poughkeepsie’s Saint Mary’s Church led by Rosa López wanted to present a folk dance. Instead of hiring dancers, an expense they had dealt with for religious events in the past, this group of women decided to stage the dance themselves. Rosa Lopez says: “it seemed to me that it would not be so difficult to start a dance group and in 2003 we began to invite people to dance with us.” By 2004, they made some marmotas, enormous paper mache dolls used as props in the dance, which “we made between my cousin Evencio López and I. They came out a little coarse but they were cute,” Rosa recalls. “Because I like to dance!” This is the first thing Heric Eloy Martínez says when you ask him why he got involved with the Guelaguetza. This dancer, born in Zaachila, had danced on the stage of the Guelaguetza Auditorium in Oaxaca de Juárez since the nineties, in five consecutive Guelaguetza festivals. “It is a very international and important event for our state, Oaxaca, and it is very beautiful because every region of the state is present,” explains Heric. The word Guelaguetza is of Zapotec origin and it designates the action of offering, sharing or giving. Also known as Lunes del cerro (Monday of the Hill), this recent festival (it started to be celebrated in 1906) is carried out the two Mondays closest to the 16th of July, which is the day of Our Lady of Mount Carmel (Virgen del Carmen) according to the catholic calendar. Groups from each of the eight regions of the state of Oaxaca (Costa Chica, Cañada, Papaloapan, Mixteca, Sierra Sur, Sierra Norte, Valles Centrales and Istmo Tehuantepec) participate in this celebration, proudly wearing glamorous costumes, each attesting to the traditions of its region. To Heric, the Poughkeepsie Guelaguetza is important because it allows him to make his culture known to others: “The Guelaguetza is an event that I love a lot because it is there that I can represent my Zapotec heritage, my indigenous culture,” he says. After getting the dancers and a teacher to show them the moves, the next difficulty was obtaining the costumes which have to be embroidered by hand and are accompanied by an enormous feather headpiece (penacho), and thus entail a price of about $1000 each. “Thank God, with support from the church and the enthusiasm of the parents, each dancer was able to buy their own suit,” Rosa recounts, and in December of 2008 the first Danza de la pluma was staged, run by the Grupo Folclórico de Poughkeepsie (Poughkeepsie Folkloric Group). In 2009 Felipe Santos joined the group saying, “Let’s put together a Guelaguetza!” according to Rosa. This is how Felipe, Lucio Aguilar and Rosa “joined the group of dreamers” who made a great effort in order to hold the first Guelaguetza in Poughkeepsie in 2009 (even paying for some expenses out of their own pocket). Felipe’s passion for sharing his recently discovered culture is, apparently, contagious. More and more people and organizations have been joining the Poughkeepsie Folkloric Group in order to help make each annual Guelaguetza festival the best it can be. An example of this is Eloy Gutierrez, from the Valles Centrales region of Oaxaca, who doesn’t dance but who has been in contact with the Mexican Consulate in New York and joined the Poughkeepsie group in 2010 after an invitation by Felipe. Thanks to his connections, the 2010 festival included the attendance of the second consul and in 2012 with that of Carlos Sada, the general consul, originally from Oaxaca. After watching the festival and being very impressed by it, he helped facilitate the purchase of 44 regional costumes donated to the Poughkeepsie Folkloric Group through the federal government of Mexico, the citizen’s council of San Sebastián Teitipac (through Feliz Gutiérrez) in the state of Oaxaca, the house of culture, Conaculta and a subsidy from the Mexican Cultural Institute of the Mexican consulate in New York. Each year the support of people and organizations not directly related to the artistic side of the festival (which is still in the hands of the GFP) is more and more visible. 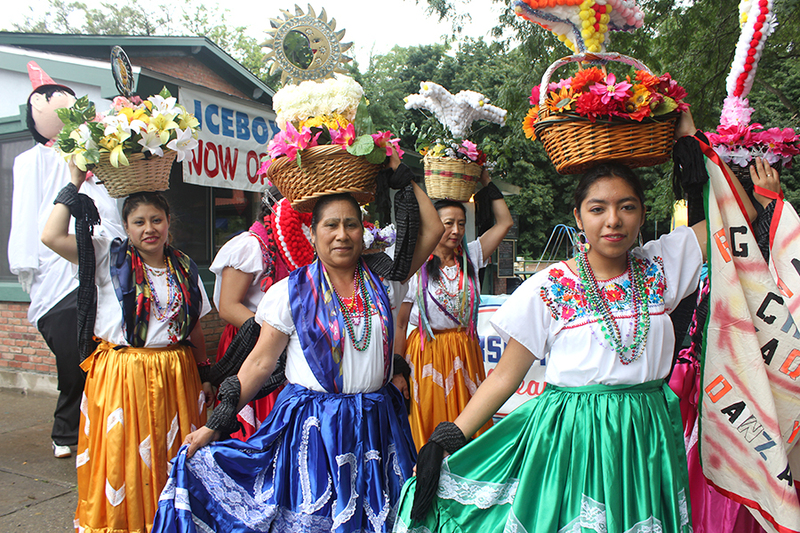 The 2013 Guelaguetza is organized by the GFP, with the coordination of Somos la Llave del Futuro, Hudson River Healthcare, La Voz magazine (Bard College), Hudson River Housing, Middle Main, Hudson Valley Patriots for Immigration Reform, Poughkeepsie Public Library, Dutchess County Arts Council, and Catholic Charities. Jenny Coronel, of Hudson River Housing and the project of Middle Main revitalization became involved in the organization of the Guelaguetza in 2010 when Felipe asked her boss, Elizabeth Celaya, to help them get a permit and spread the word in the press about the festival. Jenny, from Ecuador, was drawn in to it by the amount of people that were involved in it and the “capacity of these people to highlight the culture of Oaxaca and Latin traditions. I think it is very important to create spaces for things like this to happen, and if we can help in doing so, why not?” says Jenny. Since then she has helped in the coordination of the event, lending a hand with the administrative side of things such as building a budget. The case of American Polly Adema, is very similar. A folklorist of the Dutchess County Arts Council, she offered her help to the festival organizers after seeing the beautiful costumes, the procession and the complex dances. Featuring the Grupo Folclórico de Poughkeepsie,, the Ballet Folclórico de Nueva York , Grupo folclórico de Newburgh, and Eloisa Garcia with the Diosa del Maíz group.